Arthroscopic or ‘keyhole’ surgery is probably the commonest technique in knee surgery. Usually 2, but sometimes more, small holes are made to enable a camera to be inserted through one incision (portal), and instruments through another portal, which are then used to remove or repair torn cartilage, perform micro-fracture, remove loose bodies or to reconstruct ligaments. 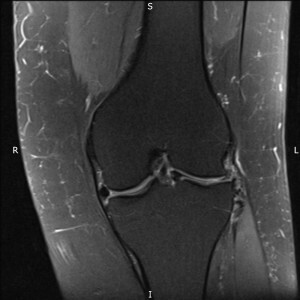 Most conditions within the knee will warrant an MRI scan prior to surgery. Indeed, some insurance companies insist on obtaining an MRI scan and they will review the report prior to approving treatment. 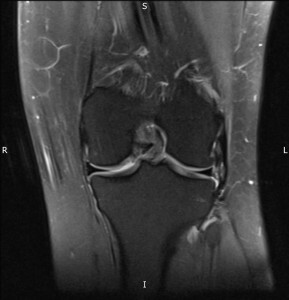 An MRI scan shows very detailed anatomy within the knee, to allow confirmation of a diagnosis, to assess additional injuries or problems, to allow a prognosis, or assess progress after treatment. A meniscectomy is the commonest form of arthroscopic treatment in which meniscal tears are removed, to produce a smooth stable remnant, and abolish the typical symptoms, which often include - pain when twisting, aching and possibly giving way. The diagnosis of a meniscal tear can be made clinically following a history and examination. On examination pain maybe felt over the joint in the area of the tear, and specific grinding tests on examination may reproduce the pain felt on twisting a knee. An MRI scan maybe required by an insurance company to confirm the diagnosis, and will highlight the pattern and severity of any tear. However, not all scans are 100% sensitive for all tears. Not all meniscal tears require surgery. Symptoms may settle from a meniscal tear and after time, allow an individual to return to activities. Some tears may heal – this tends to be the case in younger individuals, and when the tear is in an area with a good blood supply. However, a significant number of tears cause symptoms which do not settle and continue to give problems of aching, sharp pain on twisting, swelling and catching or clunking. Such tears can respond well to keyhole surgery, to remove the torn part of the cartilage, and therefore reduce the symptoms. This surgery is usually performed as a ‘daycase’, under general anaesthetic (GA), but can be performed under a spinal injection with a patient still awake. There is a separate viewing screen on which patients can observe their surgery, if they wish to do so. Success rates for meniscal surgery are 90-95%, and tend to depend on the presence or otherwise of additional injuries to the knee. Scar discomfort and avoidance of kneeling (especially important in plumbers/electricians for example). Ongoing pain, and the need for further more complex surgery. If an extensive amount of meniscus is removed at a younger age, the risk of osteoarthritis later in life is generally increased. Gentle exercise 3rd week / running 4-6 weeks, depending on any swelling after activities. Ongoing discomfort improves rapidly. Some discomfort up to 8 – 10 weeks, but mainly settled by 4-6 weeks. Off work – approx. 10 days / up to 2-3 weeks for manual based occupations. Sutures used to close portals are removed at 10 days postoperatively. 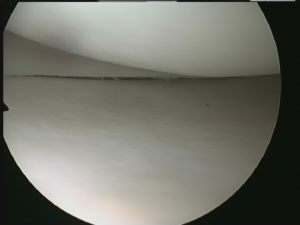 This arthroscopic technique allows a torn meniscus to be repaired with internal stitches to suture the meniscus back into place, and then heal. In addition to internal sutures, a small incision may also be required to place stitches anchored outside the joint under the skin. Meniscal repair is reserved for certain types of meniscal tears which have a chance of healing, and which therefore need to have a good blood supply. It is usually therefore, reserved for younger patients, with success rates decreasing with age. The diagnosis of a meniscal tear that is suitable for a repair is made on history, examination and review of an MRI scan. Large meniscal tears that are suitable for repair may have displaced into a position in the knee which causes the knee to ‘lock’ – which means the knee cannot fully extend or flex. Large tears that are blocking movement and causing locking, are unlikely to go back into an anatomical position on their own. Surgery is therefore, usually required to ‘reduce‘ the meniscus to its anatomical position, and then allow a repair. The results of meniscal repairs generally depend on the size and positon of the tear. Rehabilitation is stricter than for simple meniscal trimming, to protect the repair. Success rates depend on the presence of other injuries to the knee, and are approximately 70 -75%. This means that 25-30% of meniscus tears that undergo repair, will have a further tear and may then need removing. In younger individuals, the removal of large quantities of meniscus may lead to arthritic changes in later life, and hence the desire to repair meniscal tears whenever possible. General anaesthetic or spinal anaesthetic may be used. Anaesthetic takes approx. 45-75 minutes. Patients may stay in overnight, but usually go home the same day. Post-operative rehabilitation is more prescriptive than for meniscectomy. Crutches are utilised for for 2- 4 weeks. Graduated, increasing flexion of the knee, with no bend beyond 90 degrees for 6 weeks. No squatting for 3-4 months. Return to full activities – at least 4, possibly 6 months. A microfracture is a procedure to stimulate new cartilage formation on the surface of damaged bone. The technique removes abnormal, usually irregular cartilage when an individual has early osteoarthritis to produce a stable base of bare bone, and an awl is used to penetrate into the bone, in multiple places – approx. 5-6 mm apart. This then allows bleeding to fill the defect and form a blood clot. The marrow cells and blood cells then change into a fibrous firm coating protecting the damaged bone. The diagnosis of damage to the articular surface is made on MRI scan, or at the time of arthroscopy. The possibility of requiring a micro-fracture, and the more onerous rehabilitation, should usually be discussed prior to surgery. Focal contained damage to small areas of the joint respond well to micro-fracture. Alternatives in the longer term if symptoms persist include osteotomy to offload the damaged area, selective replacement of the damaged area, partial knee replacement or total knee replacement. Microfracture aims to create a ‘cartilage like’ fibrous tissue cover on damaged bone, similar to a visible scar when a skin cut heals. Results are best in younger individuals with contained defects less than 2 cm in size. The postoperative rehabilitation protocol is vital in achieving a smooth, confluent repair. Future surgery. Results of this technique do decline with time and further surgery maybe required in the form of osteotomy to offload the damaged area, or joint replacement. Anaesthetic takes 45 – 75 minutes . Return to driving depends on extent of micro-fracture required, its position in the knee, and whether it is your Right or Left knee, and whether you have an auto or manual car. Avoiding driving MAY be up to 4 – 6 weeks. Rehabilitation involves using crutches to reduce the amount of weight bearing for up to 6- 8 weeks. For the first 3-4 weeks you should be non-weight bearing on the operated leg, but bending the knee slowly, to attain around 500 bends a day. This flexion of the knee smooths the blood clot to produce a surface resembling the shape of the normal joint. The bending of the knee cannot be performed quickly as this may dislodge the clot, so the recommendation is to bend no more than 3-4 bends a minute. A static cycle is very helpful in rehabilitating from microfracture procedures. 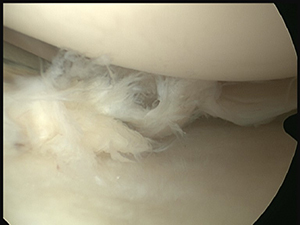 Arthroscopic view of normal meniscus with normal joint surfaces.